After reading on Flipboard on the impending trend of rainbow sprinkles gaining traction, the forecast came to pass when we encountered the colourful dessert selection at Baan Kun Ya Thai restaurant. Grandmother’s house proves an apt name for this newbie Thai resto as the chefs imbued not quite 50 shades but enough from the wide colour palette into the slew of sweets we tried. Ambiance-wise, the resto premise offers plenty of Instagrammable elements from the get-go. Rattan baskets and homely props from a typical village abode are placed at nooks and corners whilst mellow ambient lighting casts a golden glow on long banquette seats and clusters of vintage-inspired dining furniture. Like my fave Bejewelled Blitz game, the five colour ‘rubies’ or khanom tab tim krop har see (RM12) is as addictive as the online puzzle game. Served in a rotund glass, every spoonful of the crunchy diced waterchestnuts coated in translucent tapioca flour with palm and jackfruit strips and coconut cream was palate-pleasing. Similarly, the serving of bua loi tub tim (RM8) - purple floating yam ‘lotus’ coated with tapioca flour proffers smooth, slightly chewier texture, swimming in a sweet, light creamy santan. I salute the patient chef who painstakingly form the rainbow layers of coconut jelly or woon jet see (RM12 for 3 pcs) to tempt diners. The jelly toothsome texture is memorably enhanced by spot-on sweetness and santan richness. Earlier, the Thai showcase got off to an appetising start with miang kham (RM26), the classic DIY starter of wild betel leaves (Piper sarmentosum, cha phlu in Thai or daun kadok in Malay) filled with little dices of lime, ginger, shallot, cashewnuts, bird’s eye chilli, dried shrimps and the zingy house made dip. It’s such a nice way of loading up on greens. This was followed by a droolworthy yum woon sen (RM28) - seafood vermicelli salad with all the requisite sour, salty, sweet and spicy flavours. Springy squid and prawns with glass vermicelli, dried shrimps, cherry tomato halves and cashewnuts on a bed of lettuce made it a surefire crowd-pleaser. Every Thai meal calls for a hearty soup and the tom yam nam khon (RM28 – RM48 depending on choice of ingredient and portion size) fitted the bill with flying colours. Hell hath no fury like our tastebuds scorched but we still loved every drop of the bright orange-hued, zesty soup. The addition of milk gave it a subtle creamy finishing whilst assorted seafood racked up its depth of sweetness. Vegetable, chicken or prawn versions are also available. Panang phet (RM42) erroneously listed as roast duck curry - one of the house specialities – was a delectable revelation, made with tender slices of smoked duck breast to seduce and titillate discerning palates. Mandarin orange segments lent bursts of fruity juiciness, lifting the assertive red curry gravy to sublime heights. Despite its minimalist preso, the fluffy soft crab meat omelette or khai jiao poo (RM32) left us smitten. Drizzled with grandma’s special sauce and crowned with crunchy ebikko, it proved a welcome counterpoint to the spice and chilli-laden plethora we had sampled. The inherent sweetness of the steamed seabass held its own in pla neung ma now (RM46); its basic clarity undiminished by the attendant trinity of garlic, chilli and onion. Fresh coriander, sliced chilli and lime help to bestow fresh, assertive nuances to the equation. Chunks of tender eggplant and long beans brought additional textural interest in the classic Thai green curry or gaeng kiao wan (RM36). Available in vegetarian tofu, chicken or beef versions, the aromatic, sumptuous gravy tottered on the brink of lush indulgence. Fans of sai koo sai gai (RM13 for 5 pcs), big marble-sized tapioca balls filled with savoury minced chicken should be delighted to know the evergreen street food snack in the Land of Smiles is served. Thanks to its sweet-savoury nuances, the appetiser can be a curtain-raiser or meal ender. Otherwise, you can always bank on khaw niew ma muang (RM15) - mango sticky rice or tar kho (RM10 for 3 pcs), dainty squares of sago, corn and chestnut pudding topped with coconut cream in pandan casings to wrap up proceedings. We also gave thumbs up to new dessert treats such as khanom thuay (RM8), steamed pandan and coconut pudding in tiny tea cups decorated with foi thong (tendrils of sweetened egg yolk) and khanom leum kluen (RM10 for 6pcs), colourful mini mung bean flour pudding with pandan juice and syrup adorned with coconut cream. Their petite servings are enough to satisfy one’s sweet tooth minus the guilt. For reservations, call Baan Kun Ya, tel: 03-7733 3337. Address: 1st Floor, Centrepoint Bandar Utama, 3 Lebuh Bandar Utama, Petaling Jaya, Selangor. Lounge under a star-spangled sky amidst a Moroccan-style tent adorned with billowing drapes, comfy satin throw cushions and decorative lanterns. As you partake numerous specialities laid out for buka puasa, enjoy the cooling breeze from Sunway Lagoon's expansive Surf Beach. Sounds magical? This year the Sunway Lagoon team will be pulling out the stops to recreate a Moroccan oasis to let you feast like a king. Three rotational menus featuring over 20 live action hawker stalls will proffer an international selection of goodies. 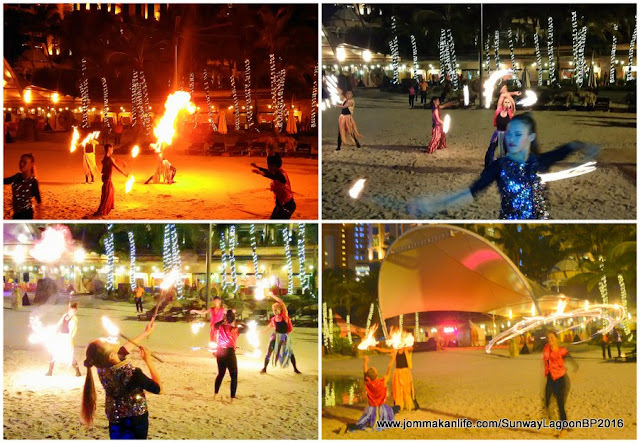 Adding to the excitement is the hypnotic performances of fire eaters and jugglers, South African acrobatics, Arabian dancers and an erupting volcano. The sensorial overload doesn't end there. A lavish buffet with the compelling showpiece of whole roast lamb is included. Decked with Arabesque pillars and ornate lanterns, the delectable array veers from local satay and murtabak to grilled steak and seafood, and chicken shawarma. My personal faves? Piquant Siam Lemak Laksa to set the tastebuds alight. Its closest rival is Nasi Briyani, fragrant basmati rice accompanied by Rendang Ayam Negeri Sembilan, Kambing Kuzi, Gulai Udang Nenas. Appetising Popiah, Thosai and Aneka Goreng - assorted local fritters should fill up any empty tummy space. Remember to go easy though if you want to wrap things up on sweet renditions of Cendol, Ice Cream Sandwiches and Malay kuihs. 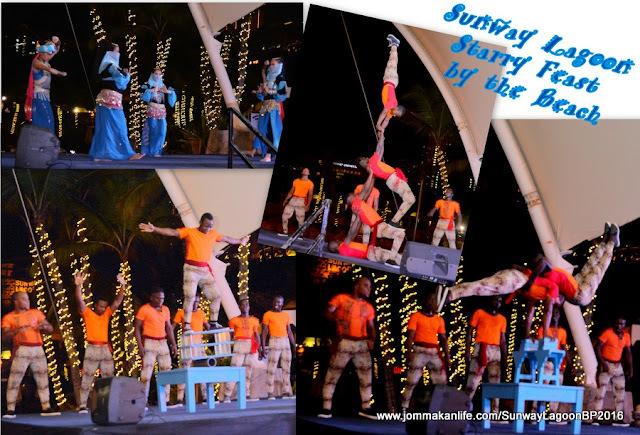 Sunway Lagoon's Starry Feast by the Beach is served every Fri, Sat and Sun from 10 June to 3 July for buka puasa dinner. Price: RM88 per adult ; RM78 per person for group bookings of 30 persons.